My main responsibility on the Revolt, She Said tour was to find and connect with new potential audiences for the films at each venue. 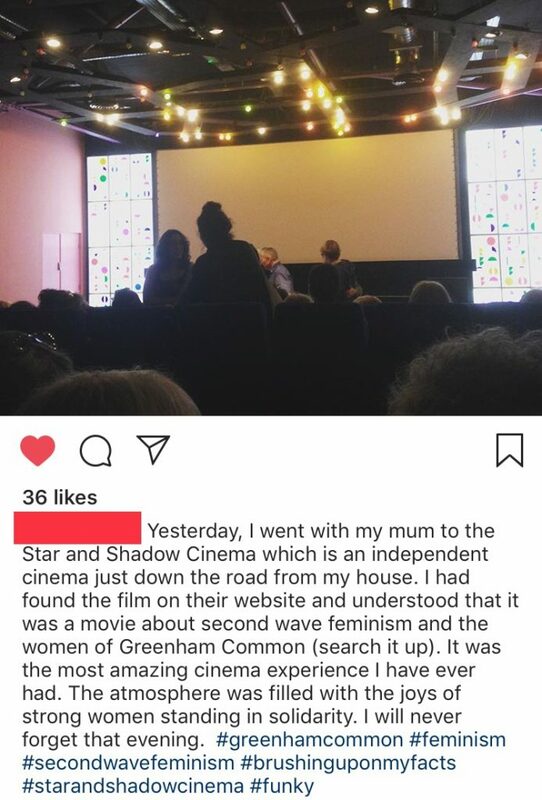 While appealing to those already invested in film culture, I looked beyond the current cinema audience to the growing young feminist communities all around the UK. I usually started with a search across social media of combinations like “location/city/region” + “feminist/women/queer”; and the results were varied and mostly very exciting. In every location from big cities to smaller towns I found feminist communities, which ran from facebook-facilitated book clubs to activist communities and collectives running events in real life. 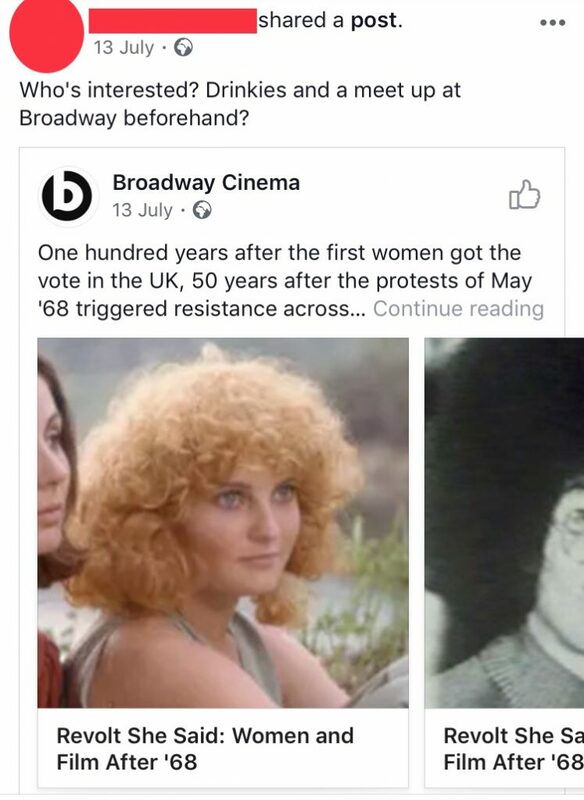 It was sad to run across an abandoned page or group and it was frustrating to occasionally run across a hateful transphobic group calling themselves feminists. Thankfully, the majority of the social media communities I found were truely feminist, welcoming to all and committed to being a safe space, most displaying guidelines/rules about what to share, all with active admins. In these groups the Revolt, She Said films were welcomed and it was always a heartening moment when I would find a group that were already discussing the films or organising group trips to see them. However, while working on this tour I did notice that activity on facebook seemed to be slowing down – other social media sites like twitter and instagram remain very active, but neither of them have the capacity to create communities in the same way as facebook once did. So it was very reassuring to find that the most actives groups and collectives I found were working to translate those virtual communities into real world spaces. I was always happy when I found a branch of GIRL GANG in any city, particularly the triumvirate of GIRL GANG LEEDS, GIRL GANG MANCHESTER and GIRL GANG SHEFFIELD. In Sheffield in particular I discovered a very active group organising a wide variety of events, from parties, to speed-mate-ing and DRAFT: an event to bring and share your works in progress and get feedback or find collaborators. These kind of events had me almost jumping on a train and moving there! Other groups with a strong political and activist purpose like Pro-Choice Nottingham – who introduced our screening of ONE SINGS, THE OTHER DOESN’T at Broadway Nottingham – were also very common and very receptive to the tour. I also found support from groups focused more on creativity like She Speaks UK, a Derby-based group who organised poetry and performance nights. 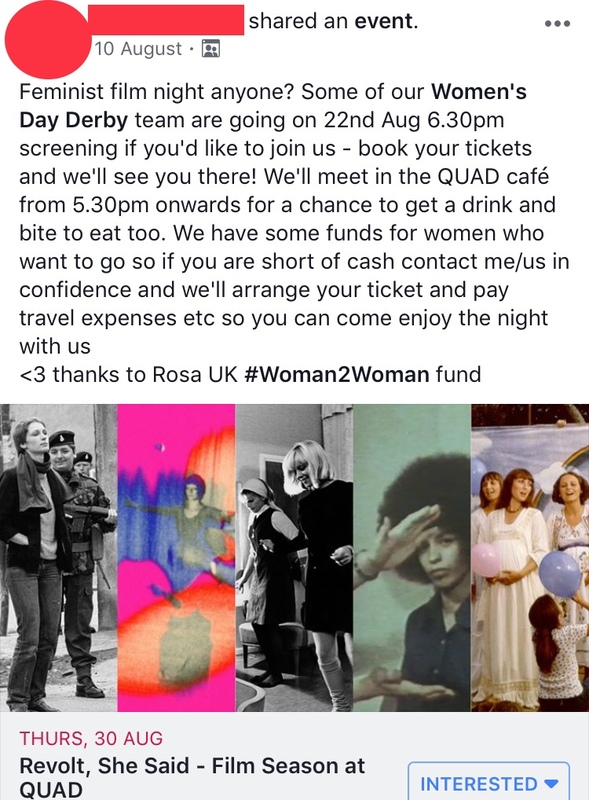 Dispersed amongst these feminist communities were many a film focused organisation, programming inventive and exciting film events which easily rival the many options in London. 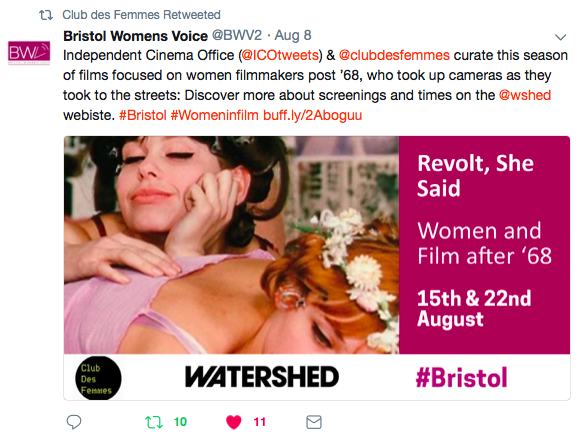 We are really grateful for all the feminist film groups, such as Reel Equality in Nottingham, who helped spread the word about our Revolt, She Said screenings. The tour began and ended in Glasgow, and it was a pleasure to connect with two film groups there: Femspectives, who joined us for our panel discussion about Mai Zetterling’s THE GIRLS, a brand new film festival focused on female filmmakers and who screen films outside of traditional cinemas; and She’s En Scene, also focused on female filmmakers and creating accessible safe spaces at their screenings. At all our screenings in Scotland we were supported by the fantastic Scottish Queer International Film Festival (SQIFF), one of our favourite film festivals. 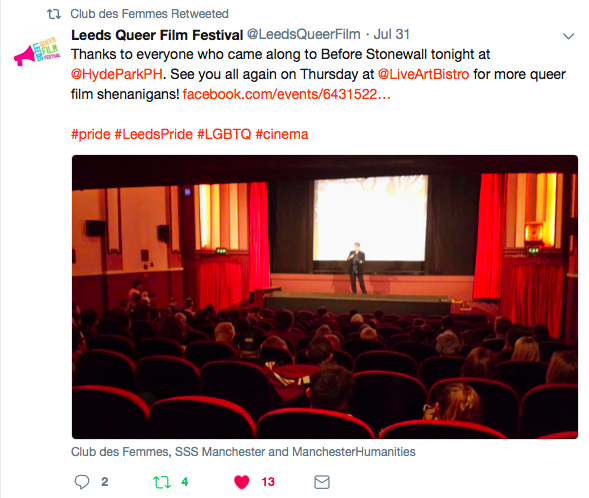 In Leeds we were also able to team up with a queer film festival, Leeds Queer Film Festival to screen BEFORE STONEWALL as part of Alternative Pride Leeds events. Our screenings in Leeds were also supported by She’s A Rebel Cinema and Film Fringe, who introduced our screening of THE GIRLS. I could go on and on about all the groups, university societies, individuals and venues, who helped spread the word about our tour and I am sure there are many many more out there, beyond facebook. Message Club des Femmes on facebook, twitter or insta to let us know about your feminist film and activist groups, and we’ll keeping joining up the revolutions!